StaffPointe, LLC | RDX Solutions, Inc.
Project Description: StaffPointe, LLC is an online system setup to provide Professional Recruiting Services with the highest level of integrity, professionalism and excellence. 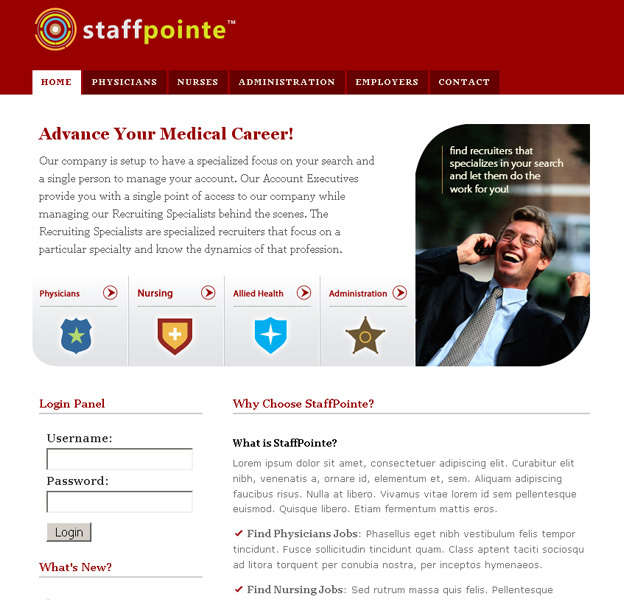 StaffPointe contacted RDX Solutions to give their brand a new image that would fit the criteria of “Web 2.0″. In the end, RDX Solutions was outbid by a competitor in terms of pricing. You can view their current site from the link below and judge for yourself of what it really means to sacrifice quality over quantity!